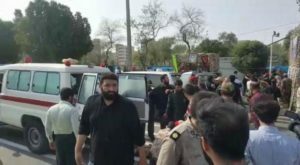 At least three people lost their lives Thursday in the Iranian southern port city of Chabahar after a car bombing targeted a police headquarters. The port is located in Sistan-Balochestan province near the border with Pakistan. Three people were killed in the attack, according to Mohammad Hadi Mar’ashi, security aide to the governor of the province, who was quoted by Press TV. Several people were injured, Mar’ashi added. The suicide attack, Tasnim news agency reported, targeted the police headquarters in the port city. Images posted online showed thick smoke rising from the sky in the area where the incident took place, Aljazeera reports. No one claimed responsibility for the deadly attack. The city in December last year was rocked by a suicide attack near a mosque. At least 41 people were murdered and 90 other wounded. Jundallah, also known as Soldiers of God, had claimed responsibility for the attack.